Words, they are so powerful. 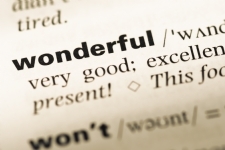 When overused or incorrectly used, a word can lose its true meaning. That vacation that was very much enjoyable yet retold as wonderful - was it truly full of wonders? The Talmud tells us that if you see Pinchas in a dream, a wonder, peleh, will happen to you. On the most basic level, the reason for this is, because Pinchas and Peleh both begin with the Hebrew letter Pei. Additionally, many wonder filled miracles happened to Pinchas throughout his life, specifically after he killed Zimri. A miracle is similar to a wonder. The difference between a wonder and miracle is that a miracle breaks the rules of nature whereas the quality of a wonder is much higher. A wonder is completely ‘out of this world’; it is not somewhat out of the ordinary, it is completely wonder-filled. Pinchas lived his life above nature. It was not that he, at times, did extraordinary acts, but his whole life was extraordinary. Life for Pinchas was not sprinkled with occasional miracles but was one never ending wonder. Because of his style of living, Pinchas did what was needed to be done without care to the consequence to himself. For Pinchas, the extraordinary was ordinary. We, as Jews, have the normal life of the Jew beginning the day with Modeh Ani, charity, prayer and Torah learning. However, we must learn from Pinchas how to be extraordinary, to go out of our daily operations and do something out of the ordinary, something that creates a complete shift in the way we serve Hashem, obviously within the confines of Torah law. When we do that, we don’t just live a good life or a miraculous life, but our life is wonder filled. Wishing you all a wonder filled life! At times, we meet people who believe that their opinion is so important that it must be followed regardless of protocol or rules that are in place. Whether said literally or not, they are in essence saying "Do you know who I am?" They may be saying that the rules do not apply to them as ‘I am different’ or ‘I am a member of the family’. According to kabbalah, Balaam and Amalek thought that because they were related to the Jews, they can influence them to veer off course and not remain true to Torah. To combat this, and the feeling from any elitist person, we need to look at another two words that line up: Yirah and Ahava - Awe and Love. When we are told that to perpetuate Jewish life, we need to act contrary to Torah and mitzvot, we need to first ensure that we are not rejecting their view based on a bias, but from a place of humility where we are in awe of G-d. Once that is confirmed, we can analyze whether the proposal is contrary to Torah-true Judaism or not. If yes, we know it is not worthwhile to pursue it, as it will not perpetuate the Jewish mission in the world. Similarly, when shown another’s elite credentials, we first need to ensure that it is not an ego battle between us and them. Only then can we go to the next step, that of Ahava, love, where we can objectively evaluate if their viewpoint is in line with our mission. We may need to be firm, like a soldier on a mission, but, it needs to be as the Rebbe told Rebbetzin Pinson – happy soldiers! With love and a smile. Mix a little awe of G-d and love of G-d together and you have the perfect potion for the strength, fortitude and peace that comes with doing the right thing. “Here's what Walmart put on sale to compete with Amazon” was CNN’s headline this week. Walmart.com ran their own promotions to compete with “Amazon Prime Day”. Reports say that the savings on this day are greater than black Friday, which was always known as the day to get the best deals. BUT DON’T DO IT! 2) My brother lives in Atlanta and runs Chabad Intown. Once, at a Shabbat Kiddush/Oneg, they had Pepsi on the table. A congregant turned to my brother and said: “Rabbi, this is Atlanta, coke town, here we serve coke”. Will my purchase make a difference to Home Depot? Probably not. However, my choice to purchase locally makes me a different person. When we buy from a local store, we sometimes pay more in the short term for the specific product, yet gain long term in our relationship with the community we are a part of. At Harford Chabad, our tagline is “Invigorating, Inspiring, Community”. It is important to do the community part. We see this in this week’s Torah portion. When the Jews wanted to pass through the land of Edom, they requested: “Please let us pass through your land; we will not pass through fields or vineyards, nor will we drink [our] well water”. Rashi comments: “Moses said: “Though we have manna to eat and a well from which to drink, we will not drink from it, but we will buy food and drink from you, for your benefit”. From here [we learn] that even if a guest has his own provisions, he should buy from the [local] shopkeeper to benefit his host [community]. When on vacation, buy from the local stores. If they have kosher food, get it from them even if you had brought your own. When at home, support your local community. 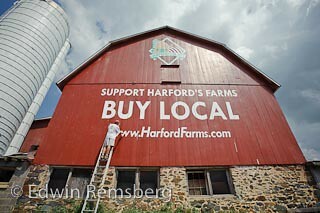 Buy local produce, use local insurance agents, support local non-profits (there are over 800 non-profits in Harford County) etc. Why? Because the most perfect community is a community comprised of individuals coming together and uniting to make THEIR world a special place to be. 1) Korach took 250 magistrates... and dressed them in garments that were wholly of blue wool.They stood before Moshe and asked him: "If a garment is made entirely of blue wool, what is the law as regarding the obligation of tzitzit?" Moshe answered them: "It is obligated." They began to laugh at him, saying: "If a garment of another sort is absolved by a single thread of blue wool, this garment, composed wholly of blue wool, cannot absolve itself?" A person who regularly makes commitments to "be better", to "do more good" or to "be more observant" might feel content with their aspirations, & not feel the need to do more. After all, he/she has and is committed to be better overall. Bugging them for specific details, or suggesting that attention be given to the minutia, seems superfluous and pointless! If the entire garment is "blue wool" do the "fringes" need blue wool? 2) Korach further challenged Moshe: "If a house is full of Torah scrolls, does it need a mezuzah on its doorpost?" Replied Moshe, "It is obligated." Said Korach: "The entire Torah, consisting of 275 chapters, does not absolve this house, and the [two] chapters in the mezuzah absolve it? G-d did not command you these laws -- you have invented them yourself." If there is a learned person, a real "Talmid Chochom", who knew the Talmud, with its commentaries, by heart. Does he need to be happy? Does he need to to be pleasant? If the house is full of Torah, does it need to be noticeable to someone on the outside? If I am a good, compassionate and friendly fellow, can't I decide my own path to connect with G-d? Why do I need a Moshe or any leader? As they say "Who needs that?" 1) It is not about grandiose plans to become a better person, but about the practical steps you take to implement the commitment. 2) It is not about how much Torah one learns, but about how much the Torah teaches you. 3) It is important not to go through things alone, one must have a master, a Moshe, who is true to the Torah's way and can guide you in the correct path to serve G-d on His terms!